Suzy Phillips minces handfuls of flat-leaf parsley at the tiled counter in the kitchen of her 1930s cottage. It’s a ritual she repeats every few Sundays, just as her mother did in Lebanon for monthly dinners with friends and family—even when sequestered to dark and dingy bomb shelters during the decades-long Lebanese War. These rich cultural traditions are the good memories Phillips chooses to recall, despite her childhood fraught with hardship and terror brought about by a complex civil war that lasted from 1975 to 1990. Phillips’ American father, whose business ventures reached into Africa, ultimately moved to another country without the family, leaving them in war-torn Beirut. At 15, she moved to the United States with her mother in hopes of a better, more peaceful future. Once in the States, it was traditional meals—a litany of Lebanese delicacies laden with spices, fresh herbs, rich sesame paste, rosewater-scented sugar syrup, conversation, and fellowship—that kept the small family unit linked to their heritage. Phillips credits her cooking chops to her mother, a woman who would have been a success in the culinary world, she maintains. But 75-year-old Salwa Farah, who now lives in Florida, grew up with few opportunities. Farah’s parents sent her out to clean houses, rather than to attend school. Once in the States, she babysat and cleaned homes to support her children. Black-and-white portraits of Farah looking movie-star glamorous appear around Phillips’ cottage. A brass coffee pot and several wooden mortar and pestle sets from Egypt, Syria, Jordan, and Lebanon hint at Phillips’ exotic upbringing. Her present life is exemplified by the colorful, shabby-chic kitchen, enamelware bowls, adopted dogs named Olive and Ginger underfoot, and the vibrant collage art by her husband, artist and writer Gabriel Shaffer. For her, life’s many influences meld in the kitchen. “People breaking bread together is important to me,” explains Phillips. “It’s an all-day event of cooking and catching up with friends.” It’s an experience she wants to replicate beyond her home with a restaurant. “I want to open doors to the community for food, love, and friendship,” she declares, tossing back strands of her thick curls with a flip of the head. Phillips is easily recognized around Asheville as a server at two popular restaurants, but her passion is at the back of the house—grinding, chopping, mixing, and making. Several investors were interested in backing a café she had already christened Zeytoon (olives in Arabic) for a summer opening in West Asheville. But with the volatile economy, a major backer was forced to pull out. So for the time being, Phillips has scaled back, and is creating a business plan for a traveling lunch truck. “I want to feed people good food,” Phillips says simply, raking a mound of parsley from a cutting board into a bowl of glistening diced tomatoes. Today’s meal is a sampling of potential menu items—a traditional feast of tabbouleh, lamb kafta, onion-sumac-parsley salad, falafel, and tahini sauce. Like a pro, she cautions that for proper tabbouleh—a traditional Middle-Eastern salad—the parsley to bulgur wheat ratio is key. One bunch of the flavorful Italian flat-leaf parsley to a quarter cup of fine bulgur provides a truer, purer taste than the grain-heavy Americanized version. Lemon juice contributes a refreshing tang to the herbs and wheat. With a deft hand she blends tahini (ground sesame paste), lemon juice, crushed garlic, and water by intuitive amounts, stirring continuously, watching with approval as the mixture separates and combines again several times during the process. This is tarator, which will serve as the sauce for both the falafel and lamb kafta (ground meat blended with herbs and grilled on skewers). Last night, Phillips prepared the dessert—a labor-intensive semolina cake called nammoura, which is studded with almonds and soaked with yogurt and sugar syrup. It will be a subtle, sweet finish to the intensely flavored main dishes. She made the kafta this morning, rolling and shaping the mixture of lamb, parsley, onions, pepper, and her fresh-made Lebanese Seven Spice around skewers so that the flavors could mingle in the fridge. In Lebanon, every household has its own mixture of Seven Spice, she explains. Ground in small batches to remain pungent, hers contains cumin, allspice, nutmeg, cloves, coriander, white pepper, and cinnamon. Chickpea flour and finely chopped herbs make up the falafel. She shapes large patties and smaller hors d’oeuvre balls, and then drops them into hot oil as some of the guests arrive and watch. Phillips is schooled in the ways of cooking for an audience. For a time, she hosted her own public access television program, teaching Middle Eastern cooking in an easy-to-follow style. She settles the guests in the garden with a cocktail—the strong, anis-flavored arak of the eastern Mediterranean and Middle East that magically turns milky once the clear liquid mixes with water. Just then, Shaffer arrives from his restaurant job ready to jump in and grill the meat. He describes their dinner parties as a happy menagerie of folk that are as nourishing for the spirit as for the body. “By transferring that energy from her hands into her food, it’s the spark that triggers people,” Shaffer marvels. 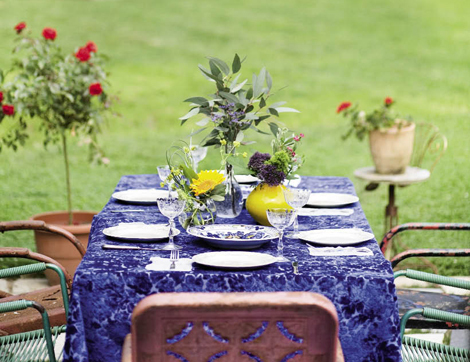 Today, even the best-laid plans and table must surrender to a summer downpour. The group rushes platters of food inside and sets up the meal as a buffet on the front porch. It’s a squeeze, but no one seems to mind standing or crowding together on the sofa. Their plates are piled high with this riot of flavors—tangy notes of sour, savory, and spicy—that call forth the balmy streets of a world, and a lifetime, far away.